Researchers from the University of Nottingham are investigating whether simple eye drops could be used to treat patients for the condition diabetic retinopathy instead of uncomfortable monthly injections. Announced a few weeks ahead of Diabetes Week (Sunday 11 June to Saturday 17 June), the new study is investigating whether work aimed at developing eye drops for the condition Age-related Macular Degeneration (AMD) could also work to prevent sight loss in diabetic patients. If successful, the eye drops could be available to diabetic patients on clinical trials within the next three to five years. Diabetic retinopathy is a complication of diabetes caused by high blood sugar levels. Over time it can weaken and damage the small blood vessels within the retina which can cause haemorrhages, leaky blood vessels and swelling on the retina. This starves the retina of oxygen, causing abnormal blood vessels to grow. If left untreated over time it can affect vision and lead to blindness. In more serious cases, the leaking blood vessels behind the eye can lead to the condition diabetic macular oedema in which fluid builds up in the macula, the part of the eye which provides us with our central vision. The condition of patients with diabetic macular oedema can decline very quickly and can lead to rapid visual impairment and blindness. In the human body, a protein called VEGF (vascular endothelial growth factor) is responsible for the normal formation and growth of blood vessels. But in diabetic patients a type of VEGF is produced which causes the faulty blood vessels to grow and leak fluid into the eye. Current treatments target all forms of VEGF which prevent the growth of the faulty blood vessels but also stops the re-growth of normal blood vessels to help the eye recover from the effects of the high blood sugar levels. Studies have shown that in models of AMD, drugs can be used to target the protein SRPK1 which can switch off the detrimental form of VEGF and enable the good form of VEGF to promote normal blood vessel growth and protect the endothelial cells which line the interior surface of the blood vessels. The current drug, which is used to switch off VEGF completely, is a large molecule, meaning it can only be administered by injection. However, the drugs which target SRPK1 are much smaller meaning that they could be given in the form of eye drops. 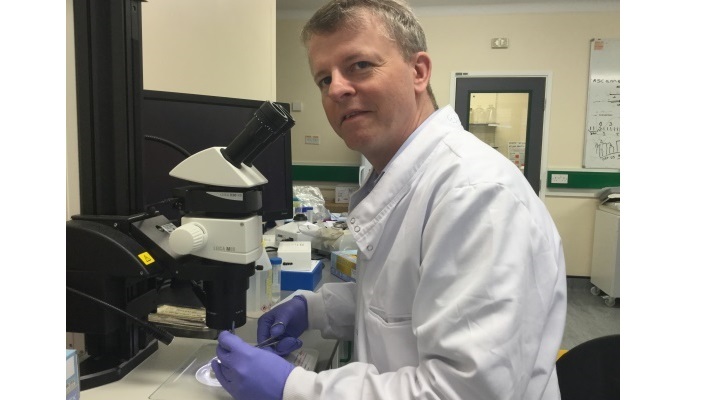 The research has been made possible thanks to a £60,000 grant from Nottinghamshire Freemasons and £37,000 from the National Eye Research Centre. The eye drops for AMD are likely to be in clinical trials within two to three years, and could be followed shortly with a multi-centre year-long phase 3 clinical trial for diabetes patients. Around 1.2 million people are believed to suffer from diabetic retinopathy in the UK, with around 750,000 of those currently experiencing some form of visual impairment. RNIB estimates that the total economic cost of sight loss including healthcare, social care and loss of employment, could be as high as £28bn per year. Globally, the condition affects in the region of 93 million people.